We are no longer living in a world where it’s practical to disregard or avoid ‘screen time.’ Children of today are being born into the digital era, and they need to be prepared for the digital life that lies ahead for them – whether that be web-based study, online shopping, or chatting virtually with family and friends. 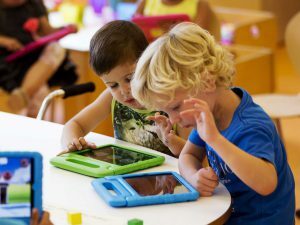 At a recent early childhood learning conference in Australia, exposure to digital technology was described as ‘essential for child development’. Instead of debating the pros and cons of technology in the early childhood classroom, teachers should ask, “How do I choose appropriate technology tools to enhance and support children’s learning?”. In addition to developing children’s skills and abilities, well designed programs will include a variety of hands-on experiences that promote cognitive, social, emotional, and physical development. Progressive centers understand the importance of focusing on the whole child. In a technology-advanced and ever-changing world, incorporating technology into the preschool classroom proves to be a powerful tool for helping children develop foundational skills in several important subjects. One question that often arises is how do we balance the educational benefits of digital technologies with the American Academy of Pediatrics’ recommendation to limit screen time for young children? In 2013, the National Association for the Education of Young Children (NAEYC), together with the Fred Rogers Center for Early Learning and Children’s Media, published a position statement endorsing the use of digital technology for young children. The statement provided a clear framework for effective, appropriate, and intentional use of technology and media with young children in the digital age of smartphones, multi-touch screens, and apps. The following key messages were intended to guide educators in early childhood settings on the selection, use, integration, and evaluation of technology tools for learning. Attention to digital citizenship (privacy concerns) and equitable access is essential. The key is to pay attention to the quality of digital media exposure, as well as the quantity. Appropriate use of technology in early childhood classrooms will focus on enriching content that teaches vital skills and concepts, rather than mindless entertainment that displaces offline activities and social interaction. Fred Rogers demonstrated how to use the technology of his day to support early learning with an emphasis on relationships, communication, and social and emotional development. He was a child development expert who always kept the child first and integrated technology in the service of positive self-esteem and healthy relationships. As Fred Rogers said, “No matter how helpful they are as tools, computers don’t begin to compare in significance to the teacher–child relationship, which is human and mutual. A computer can help you to learn to spell H-U-G, but it can never know the risk or the joy of actually giving or receiving one” (Rogers 1994, 89). Fred was a media mentor to countless children, parents, families, and caregivers. Teachers can use technology in a purposeful way that is similar to other learning materials, such as blocks, art supplies, toys, books and writing instruments. Technology is one valuable tool for children to record, save, revisit and share what they learn from their lessons each day. Digital media can introduce concepts that may not be readily available in person — such as historic events or people, extinct animals or geography. Assistive technologies can promote the development of children with special needs. Preschool technology tools may also promote an early foundation for digital literacy — in which children learn appropriate ways of using technology for constructive learning activities, rather than for mindless, passive entertainment. Childcare centers should follow developmentally appropriate practices when developing curriculum, planning lessons and selecting learning tools, including technology. Teachers should be intentional about incorporating technology into any lesson plan. Electronic devices must be used in a way that promotes active, hands-on learning experiences. Lesson plans should emphasize co-viewing or co-usage alongside teachers and peers. Teachers and preschool leaders must take the time to observe children’s use of technology to identify potential problems, evaluate learning outcomes and adapt accordingly. Preschools can also use technology to facilitate parental involvement. Many parents wonder how they can encourage healthy digital media habits at home. One early childhood expert emphasizes that technology should be used mindfully and not mindlessly. An important rule of thumb is that the content on the screen matters. Look for websites that feature engaging characters, encourage guided play and minimize distractions. Parents using media together with children leads to more learning — this is true of all media, including books, television and computers. Instead of letting your child use the computer alone, help him or her find content that facilitates singing, play and learning activities that can be performed together. Co-view or co-play with your children. To succeed in our digital information age, childcare professionals of today need access to technology that supports their work processes, offers online learning and professional development opportunities, and provides the ability to connect and network with parents, staff and other professional peers. Ultimately, childcare software isn’t just intended to make jobs easier, but to provide improved learning and development outcomes for children in care. And that is something on which we can all agree.